In 1956 John and Josephine Kelleher took over the running of Salthill Service Station from Esso Ireland with two pumps and a hut. Over the coming years, they extended it to a workshop and a car accessory shop until it grew to a three bay garage. In 1974 they were appointed the second Volvo dealer in Ireland and in 1985 were appointed Suzuki dealer for Galway City and County, afterwards the premises was extended to a new workshop facility and showrooms. In 1993 the existing site was extensively developed into a modern pump layout with the addition of a 24-hour shop, new supermarket and carwash. 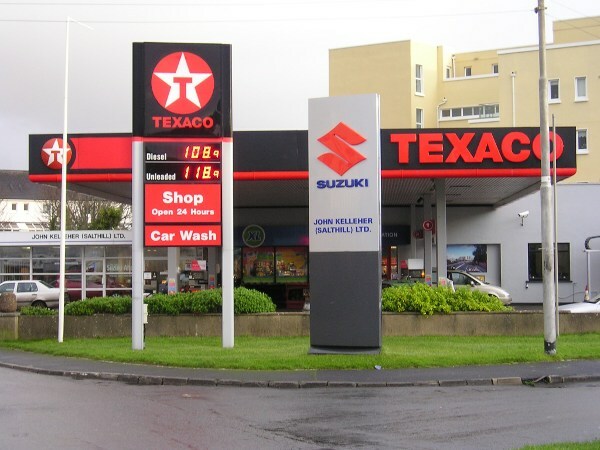 In 2005 we made a bold decision to move from Esso to Texaco and in 2009 we re-developed the shop to a modern XL Stop & Shop. After the sad passing of John Kelleher in Febuary 2014 The Business passed to Sean Kelleher the Second Generation. We start 2016 with great optimism and are glad to say we employ 25 staff. This year we celebrate our 60 th Birthday “Happy Birthday”.